is working to drive down the cost of renewable energy, but today one of the bottlenecks is the difficulty of obtaining approvals for siting and permitting of generation and transmission facilities. We need to find a way to ‘green light’ clean energy projects while making sure to protect sensitive landscapes and wildlife habitats. 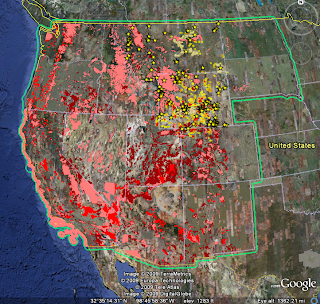 As part of Google.org’s Geo Challenge Grants program, the National Audubon Society and Natural Resources Defense Council (NRDC) have created maps of restricted lands and sensitive wildlife areas in the Western U.S. NRDC produced a map of 13 western states (and more than 10,000 individual conservation areas), showing all of the areas, such as parks, which prohibit or restrict development due to federal and state regulations, as well as sensitive areas where development should be avoided. Audubon researched and mapped critical habitat for birds and wildlife in Wyoming, Montana, and surrounding areas, sites which should also be avoided when planning energy development. To view these maps on Google Earth, download the layer here. These maps can serve as a starting point to enable a more collaborative approach to energy siting decisions. By identifying areas that developers should avoid, we hope that the site-specific approval process can be streamlined – possibly by creating green energy generation and transmission corridors that have an expedited approval process. To solve the climate crisis and meet our growing demand for energy, we need to move to clean, renewable energy sources that will cut global warming pollution and power our economic recovery. This goal requires construction of clean energy generation plants and transmission lines on an unprecedented scale. Google.org’s Renewable Energy Cheaper Than Coal initiative is working to drive down the cost of renewable energy, but today one of the bottlenecks is the difficulty of obtaining approvals for siting and permitting of generation and transmission facilities. We need to find a way to ‘green light’ clean energy projects while making sure to protect sensitive landscapes and wildlife habitats.